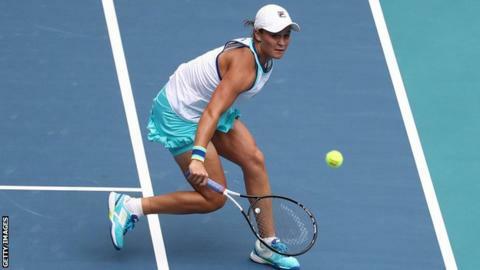 Australia's Ashleigh Barty claimed the biggest singles title of her career so far with victory over former world number one Karolina Pliskova in Miami. The 22-year-old will move into the world top 10 - the first Australian to do so since Samantha Stosur in 2013 - after a 7-6 (7-1) 6-3 win. The 5ft 5in Australian's win in Florida on Saturday means the first 14 events of the 2019 women's singles season have all been won by different players. Barty's victory continued her remarkable renaissance since returning to the sport in February 2016 having quit two years earlier to play professional cricket. Now the 2011 Wimbledon junior champion is celebrating her first WTA Premier Mandatory title - the tier of tournaments below the Grand Slams and WTA Finals - and climbing to ninth in the rankings. Despite only finishing her semi-final win over French Open champion Simona Halep after 1am local time earlier on Saturday, Pliskova made a confident start by breaking Barty's serve and moving into a 3-1 lead. "I had to keep it physical, make as many balls as possible and keep my running shoes on," she said after a match which lasted one hour and 42 minutes. "I am very tired but Ashleigh came up with the goods today," Pliskova said.